For more than five years I've studied, analyzed, and tracked down malware. From adware, trojan droppers and CMS brute forcers to remote access trojans and state sponsored malware. I've seen their behaviors, studied their tactics. I got pulled into the mythical quest of 'Finding Zero Days Attacks' and I came back from that. In all this time I realised that attackers do not need complex malware and techniques to achieve their goal. The most fantastic cyber heists were done with simple tools, and a lot of patience. How does this looks like? I will review quickly how the threat landscape looks like and highlight some examples in where very simple malware was used in cyber espionage and to target people. My focus was always into helping people. And now, joining CivilSphere I will be able to work for those that need it the most. What are we aiming at? Why? I'll explain this with some examples. Bio: I'm an information security researcher from Argentina. My research has a strong focus on helping people and involves different areas, from wireless and bluetooth privacy issues to malware, botnets and intrusion analysis. I presented my research on dozens of international conferences such as BlackHat, EkoParty, Botconf, Troopers, and others. Since 2017, I've been also participating as committee reviewer of several conferences, including BlackHat EU, GreHack, and BSides Zürich. I'm the co-founder of the MatesLab hackerspace (@mateslab) based in Argentina. I'm also the co-founder of the Independent Fund for Women in Tech (@womenintechfund), which aims to change the participation ratio of women at security conferences by providing free tickets to attend those events. I participate of Security Without Borders, a collective of cyber security professionals helping journalists from targeted attacks. In February 2013, I finished a five years career in Information Systems Engineering at FASTA University, Argentina. I worked for 2 years on my final thesis in the area of web application security. The goal was to analyze web application's traffic in order to detect behavior anomalies. This research was part of a larger project carried on by CITEDEF (Institute of Scientific and Technical Research for Defense). From 2013 to early 2018 I worked in the Cognitive Threat Analytics team (Cisco Systems) where I specialised on malware network traffic analysis and threat hunting at big scale. I led a threat research team, leading simultaneous research projects, mentoring young people, and leading the threat research publication efforts in the group. I worked closely with ML/AI researchers to develop new algorithms and improve existing ones, in order to better detect cyber threats. 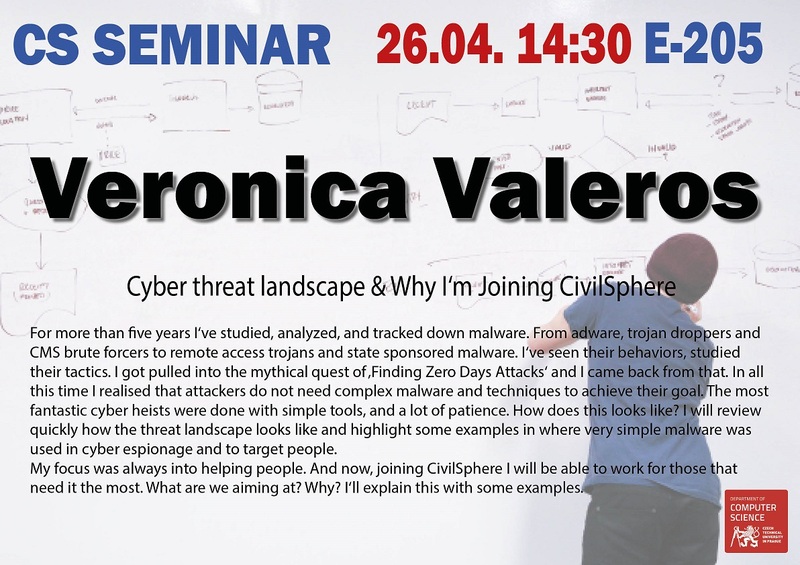 Since April 2018, I joined the Czech Technical University where I'm leading the Civilsphere project. This project aims to help NGOs from targeted attacks and cyber threats that may threaten their activities. In my spare time I'm studying and researching remote access trojans in a project called 'A Study of RATs', learning Italian, studying graphic design, journalism, and public speaking.